I was compensated for this, but all opinions are my own. I’m sure you’re all aware of the snow that has been hitting the North East over the past couple of weeks. I can’t remember a winter like this EVER. We haven’t had a full week of school in over a month because the temperatures are dipping so low that it’s necessary to have a two hour delay in the morning to give it time to warm up to above zero. Talk about cold! The last snow storm we had over the weekend dumped another foot of snow, but this time I was prepared with ingredients for the perfect cookies to eat after playing out in the snow. 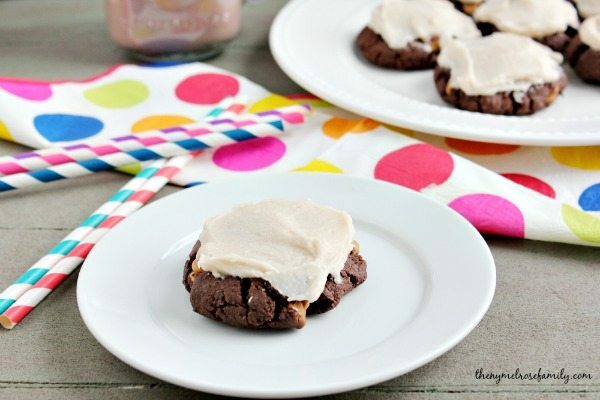 Our hot chocolate cookie recipe is super easy and the frosting makes this cookie irresistible! 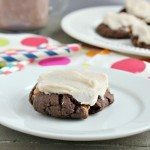 Before I dive right into the recipe I need you to truly understand how much snow we have right now and why a sweet treat like these Hot Chocolate Cookies were a necessity. 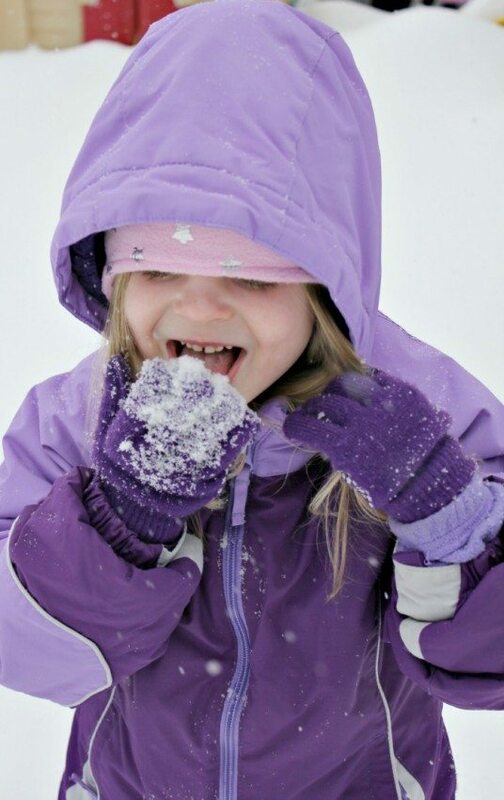 This is was our third storm that we’ve had where more than six inches of snow was dumped on us. We have also had Antarctica-like temperatures so nothing has melted. It just continues to pile up to the point where it is difficult to walk through. Riley of course could care less. She throws her body through the snow and tells me to walk in her foot prints so I don’t fall. Yes, my five year old thinks that her mother is a wimp. Maybe, I am! 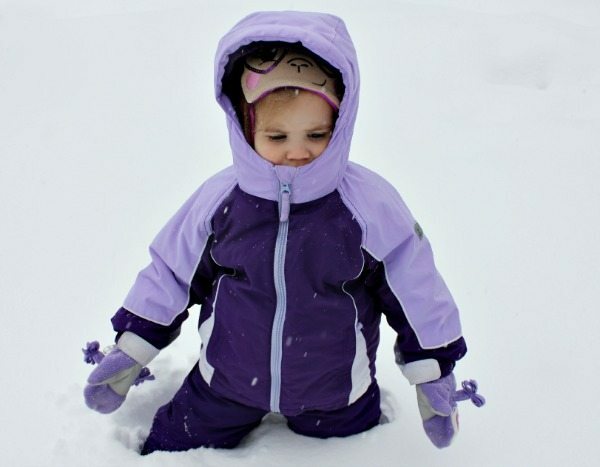 Avery, on the other hand, cannot take a single step in the snow because it comes up to her hips. Think about being in an ocean up to your hips. Now add twenty pounds of clothing that makes it feel as if you’re wrapped in bubble wrap. Yep, you’re not going anywhere! She’s a good sport about it though. She loves wearing her boots and doesn’t complain when were outside. Although, come to think of it, I do most of the work because I have to carry her in order to follow in Riley’s footsteps. 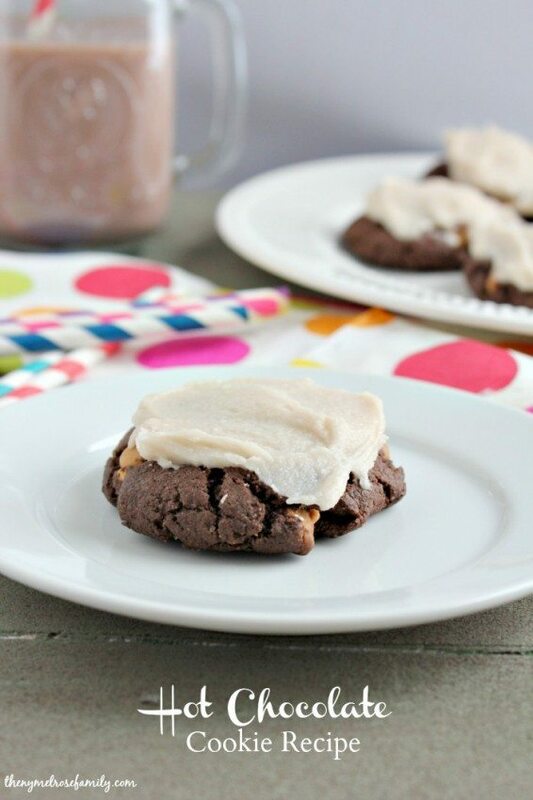 My girls definitely give me a workout though so my Hot Chocolate Cookie Recipe is well deserved! Both of my girls love hot chocolate, but Riley is not patient enough to wait for water to boil. Luckily, TruMoo makes Chocolate Marshmallow milk that all you need to do is pop it in the microwave quick and you have hot chocolate! TruMoo Chocolate Marshmallow is made with wholesome low-fat white milk, no artificial growth hormones or high fructose corn syrup, and is brought to you by your trusted local dairy. You just can’t go wrong and it tastes so good! As many of you know I have a thing for flavoring frosting. Remember my Coconut Creme Frosting for our Almond Joy Cupcakes or my Cookies & Cream frosting for my Oreo Cupcakes. 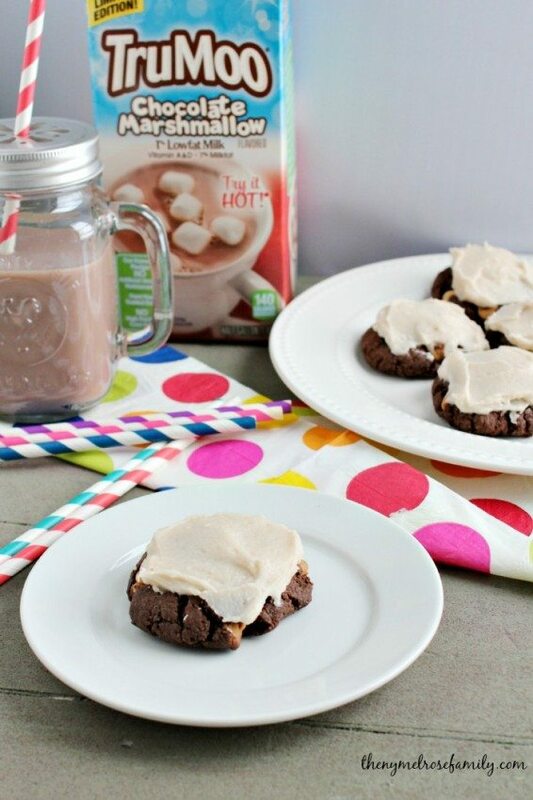 So it just made sense to make chocolate marshmallow frosting to create the perfect Hot Chocolate Cookie Recipe. The best part is that it’s so simple because the cookies are cake mix cookies. 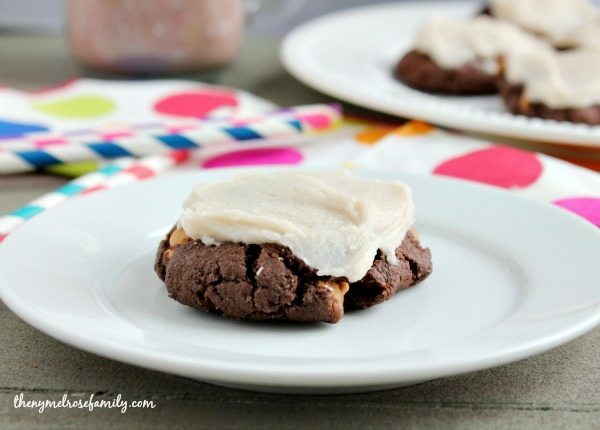 If you haven’t tried cake mix cookies yet, then you are missing out. They are super simple to make and taste amazing! 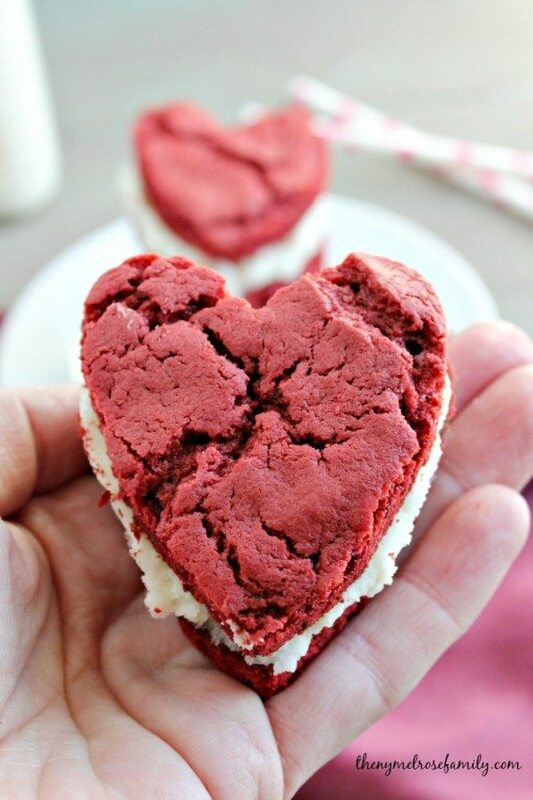 We recently made a Red Velvet Cake Cookie with Cream Cheese Filling that is absolutely out of this world. All you need is your favorite cake mix, 2 eggs, vegetable oil, flour and vanilla extract. That’s it! You can also add in nuts, chocolate chips, sprinkles, etc. to kick them up a notch or two. Preheat the oven at 350 F and grease a cookie sheet with coconut oil or line with parchment paper. Mix the Devil's Food Cake mix with 2 eggs, vegetable oil, vanilla and flour. Stir in white chocolate chips and roll the dough into tablespoon size balls. Place on the cookie sheet and flatten a bit. Meanwhile beat the softened unsalted butter with the vanilla extract. Add in the chocolate marshmallow mix and beat. Slowly add in the confectioners sugar one cup at a time until the frosting has combined. Let the cookies cool and frost the top.